Relay is a free Windows 8 Live Tile Reminder app that lets you set reminders for important tasks and to-dos you have to do. The app gives live tile reminders about these tasks on the start screen and also notifies about the same, using an alarm. You can set as many reminders as you like. These reminders would help you in remembering about the tasks that you have to complete. 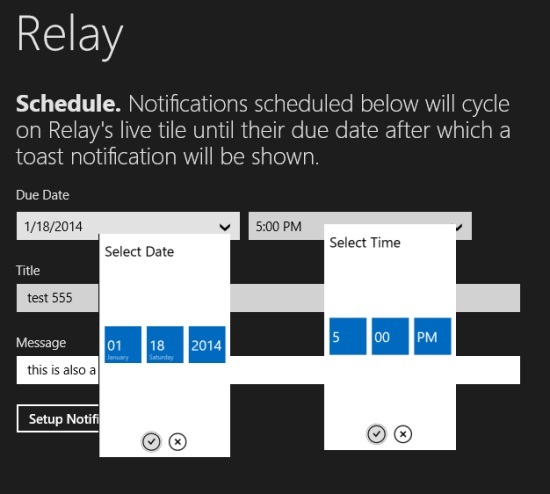 Relay is freely available in the Productivity category of the Windows Store. You can also search for it using Win + Q key combination, or use the link given at the end of this article to get the app from Windows Store. Relay is a very simple app. You can set the reminders easily, as working of the app is very easy. Let’s see how you can use this app. As soon as you get into the app, the option to set the reminder would be shown to you. The screen would mainly be having two portions. The one on the left would show you the options to make the settings regarding the reminder. On the right side, all your reminders will be previewed. Firstly, you have to select the date and time, for the task which has to be scheduled. As you click on the Due Date option, you would be shown a panel where you can provide the date. Use the drop downs that are present there to set the date, month, and year. To change the figures that are appearing there, you just have to click on any one of them and use your mouse scroll buttons. In the same way, you can set the time in the adjacent box. The Title and message are to be set below the date, in the text boxes that are available below the date option. These things would be shown to you in the notification that will be shown at the time when any task is to be done. After these have been specified, you have to click on the Setup Notification option button to complete the set up. The reminder would add up to the right side. On the launching tile of the app, all the reminders you have set, would be shown. A thing to keep in mind is that you would have to resize your app’s tile to the rectangular one so that all the reminders can be shown to you. When it is time to do the task. you would also be notified by using an alarm. Also check Remembrall, Reminder Toast, and BirthdayReminder. Tile notification for important tasks. The app is freely available in the Windows Store. 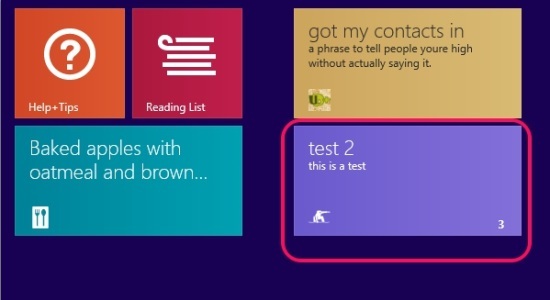 Relay is a nice Windows 8 Live Tile reminder app with good options like alarm notification. The tile notification of the app is also quite good. You should try it for sure.